Round Island Riverside Park is the developed, northern side of this trail site complex comprising two adjoining properties. The park has restrooms, a boardwalk, trails, a two-story observation tower, viewing platform, boat ramps and a canoe/kayak launch. Watch for Tricolored Heron, Snowy Egret, Brown Pelican and other waterbirds from the boardwalk, tower and platform, or bird the lagoon via kayak. In the fall and winter months, Manatees may be present in the creek and can be spotted swimming under the bridge or in front of the boat ramps. 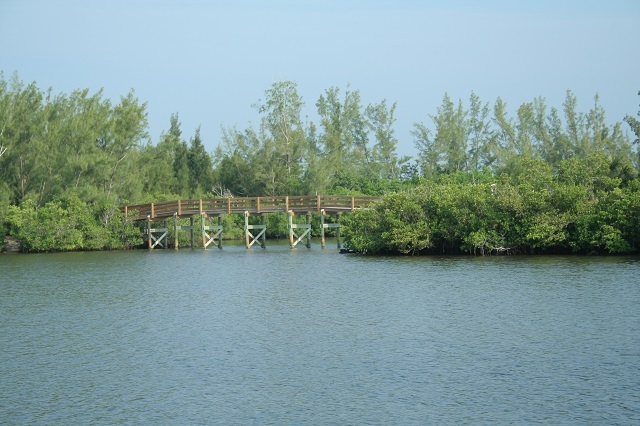 To look for waterbirds like Limpkin, Clapper Rail, Black-crowned Night-Heron, Caspian Tern and Wood Stork, go to the Riverside Park’s boat ramps in the southeast corner, and take the impoundment loop trail (hike and bike) south through the mangroves. The second property, Round Island Conservation Area, can be accessed in two separate places off the southern boundary of Riverside Park. Look for a trail opening in the live oaks approx. 100 yards west of the main park entrance, or walk back east from the main parking area, along the treeline. The trail meanders through a picturesque, maritime hammock where up to 20 species of wood-warbler have been spotted including Cape May, Blackpoll and Wilson’s.